With the DreamHorse, Barbie is going to have a lot of adventures and the Barbie fans are going to be there to watch it all unfold in front of their eyes. The DreamHorse features sounds that will tickle the little one. With each “neigh” this horse puts off, your little girl is going to have a smile on her face as she watches Barbie gallop around. Not only does this horse feature sounds and motion, but it can also interact with the little girl through the touch and sound sensor. There’s different modes on the horse, which will enable different play. The horce is capable of walking and turning 360 degrees or neighing and eating (the horse comes with a bunch of carrots). There’s a mode called Fun and Games. When this mode is activated, when you touch it, the horse will nod yes or no. The DreamHorse can also play music and dance to a total of three songs. There’s just something special about toys that contain music – it really helps the imagination flow. Barbie is wearing a beautiful riding tunic, removable boots, a helmet (for her safety, because we wouldn’t want her bumping her head if she fell of that horse) and molded pants. Looking at her, she is obviously ready to ride into her imagination. The horse is just as beautiful as Barbie – it features a pink saddle (because what little girl doesn’t love pink) and reins. The horse has a long blond mane and a luscious golden tail that adds to the excitement. For the DreamHorse though, the colors and decorations may vary. Children as young as three can play with this toy – if you get this for your little girl knowing she is a big Barbie fan, it’s going to be her playmate for many years to come. The toy is user friendly and has various mechanisms that are controlled by simply clicking the buttons. With a simple click, Barbie can swing up into the saddle and get ready to head out on her adventure. You can put your hand on the horse and press a button and watch Barbie maker her own move to get on the horse. 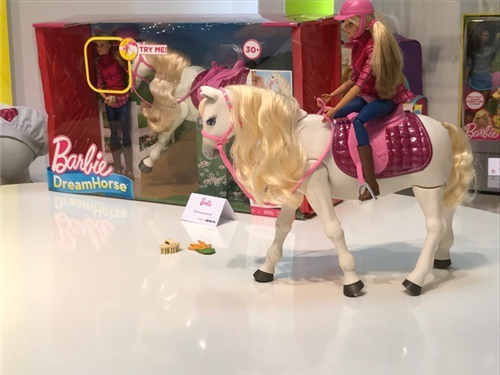 If you have a little girl that just so happens to be a big Barbie fan, then Mattel’s Barbie DreamHorse would make a great present for her. Besides, every Barbie needs a horse to get around on! can walk forward, turn 360 degrees and neigh when you play. room the long mane and tail and add to the nurturing fun.